Photo: Indonesia's Ministry of Transportation. 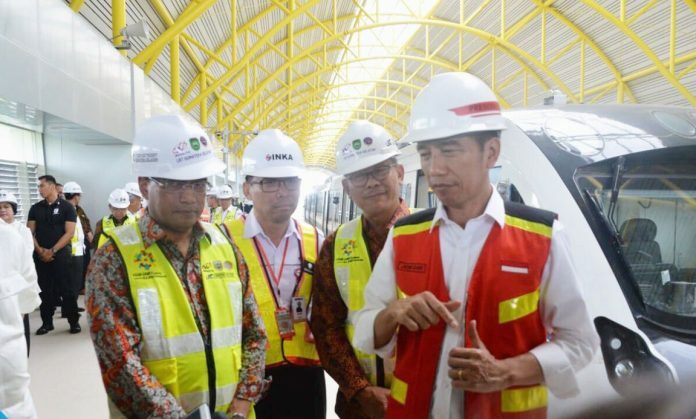 President of Indonesia Joko Widodo has inspected the Palembang light rail transit system (LRT), South Sumatra province, ahead of its launch for the 2018 Asian Games in August. The new LRT is part of the country’s wider infrastructure development programme that has been accelerated since 2014, when Indonesia stepped in to replace original hosts Vietnam who withdrew for economic reasons. Around 95 per cent of materials used in construction have been sourced from Indonesia, according to the president, including the rolling stock which is being made by PT INKA. Elsewhere, transport minister Budi Karya Sumadi has reviewed progress on construction of the 5.8km Jakarta LRT Phase 1 between Kelapa Gading-Velodrome, which is now 75 per cent complete. Sumadi said he has instructed the Ministry of Transportation’s rail infrastructure director to gradually certify the LRT so that it will be operational for the 2018 Asian Games. Phase 1 of the Jakarta LRT is expected to be inaugurated on August 10 ahead of the Asian Games beginning on August 18.